For the next five weeks I will be traveling throughout New Zealand and Australia focusing much of my attention on food, of course, and the multitudes of new olive estates, wine vineyards and artisan cheesemaking that have boomed in the past decade. Check back in a few days for more of the Traveling Food Lady in New Zealand and Australia. As soon as I figure how to load pictures on public computers I will post them! 1 Bottle of Burgundy Wine-and a glass for the chef! Pour the wine, add the sugar and place the cloves in a pan deep enough to hold all the pears. Simmer the ingredients. Add the peeled pears, including stems and simmer for thirty minutes, turning occassionally to get an even color throughout the pears. Cool in the wine mixture. Serve at room temperature. 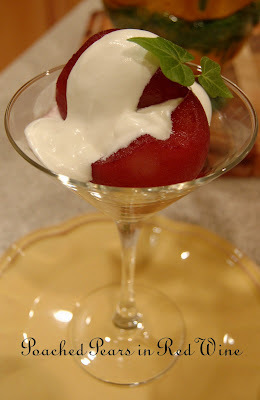 You can serve the pears with a few spoonfuls of wine mixture or drench them in a sweetened thick cream....... any way you serve them, this is a marvelous dessert. Everyone is not going to have an interest in wines, however, since posting several articles about the Loire region, I am delighted to introduce an old wine in a new facility. Located along the northern bank of the river, you will find this artistically decorated and bright new showroom with an exceptional staff . While you are visiting the property, be sure to take a tour of the caves. 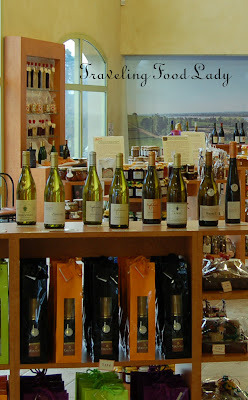 Vouvray has produced some remarkabe and notable wines, one being their Chenin Blanc. 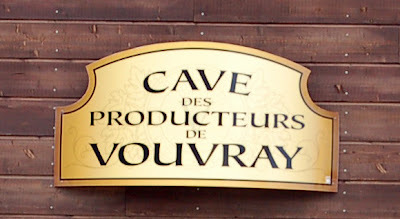 Vouvray also produces a sparkling wine, one to pop into your picnic basket as you enjoy a picnic lunch along the many beautiful spots of the nearby river. 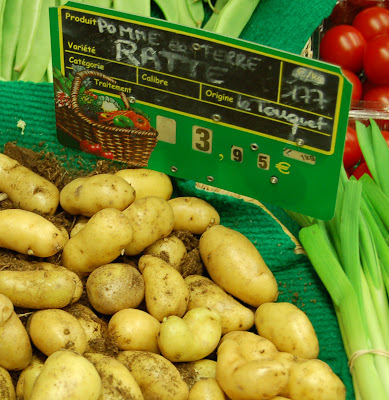 Over 350 different varieties of potatoes exist in France today. The next time you walk through a market, notice the different varieties. The most cherrished of these are the Rosa, the Roseval and the Ratte. You are viewing the Ratte. I love this word! 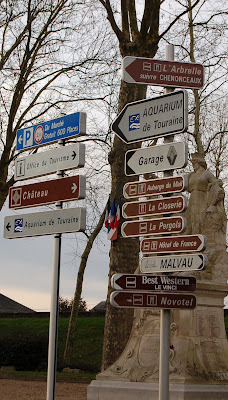 A recent post of mine gave you a view of Amboise, a small town located along the banks of the Loire River. In this region, known as the Garden Of France, you will find an abundance and variety of cheeses. 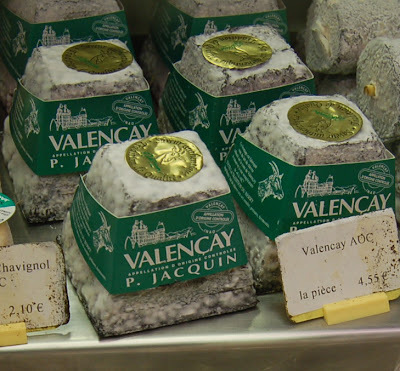 One that I am particularly fond of is Valencay. This is a goat cheese recognized by its shape, similar to that of a small pyramid. The cheese has been smothered in powdered charcoal which is done primarly to encourage the blue mold to appear. It is perfectly safe to eat-I hope-have had my share of it and I'm still running around! Way back in the 8th century, the Saracens, who were originally of Arab decent and from Spain, settled in France. As they were repelled near Poitiers, ( this is where our friend Mimi's family lineage begins, www.Frenchkitcheninamerica.blogspot.com , they left behind their possessions of goats and formulas for making the cheese. Hence, we have that wonderful cheese available today. 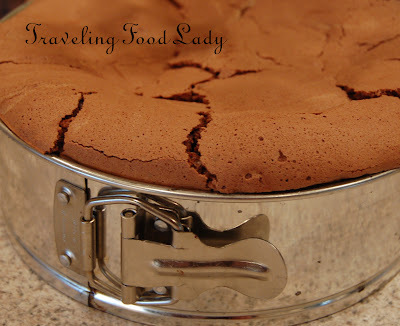 This is a cake with a fudgy moist center and crisp fragile crust . It never fails to bake perfectly everytime. You have all the ingredients on hand, so have fun! Preheat the oven to 325 degrees. Butter a nine inch springform pan. 10 ounces of bittersweet chocolate. 6 tablespoons of butter, save the other two from the stick to butter the pan. 6 eggs separated, save the whites. Place the chocolate in a bowl suitable for the microwave. Warm the chocolate until it can be stirred and mixed well. Remove, cool for a few minutes, then add the room temperature butter. Mix well. Whisk in the egg yolks. Beat the egg whites in a separate bowl to until soft peaks form. Add the sugar, beating the egg whites until glossy. Whisk in 1/4 of the beaten egg whites into the chocolate mixtue. This will help in the folding process when you add the rest of the egg whites. Using a large spatula, fold in the remaining egg whites. Pour the mixture into the buttered springform pan. Smooth the top. Place in oven and bake 40-50 minutes or until the cake is set in the center. It should jiggle just a little. Touch on top , the cake should be firm. Cool completely and sprinkle with powdered sugar. Tucked along the banks of the Loire River is the small town of Amboise, just about an hours ride on the TVG from Paris. 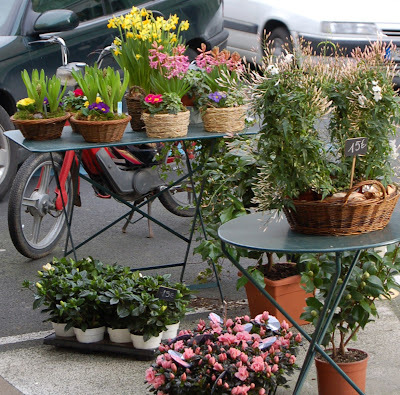 Small streets with shops and cafes will entice you to stay for a while......a great stepping off point to visit the grand and magnificent chateauxs of the Loire Valley.